This is the historical front-end, inherited from the MPL book. It provides a transition table made of rows of different names and functionality. Actions and guards are defined as methods and referenced through a pointer in the transition. This front-end provides a simple interface making easy state machines easy to define, but more complex state machines a bit harder. We are now going to build it with MSM's basic front-end. An implementation is also provided. row takes 5 arguments: start state, event, target state, action and guard. a_row (“a” for action) allows defining only the action and omit the guard condition. g_row (“g” for guard) allows omitting the action behavior and defining only the guard. _row allows omitting action and guard. The other limitation is that the MPL types are defined only up to 50 entries. For the moment, the only solution to achieve more is to add headers to the MPL (luckily, this is not very complicated). 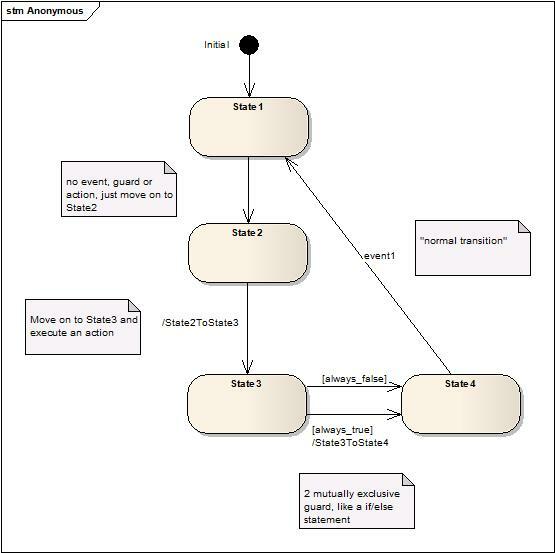 Notice how the entry and exit behaviors are templatized on the event and state machine. Being generic facilitates reuse. There are more state types (terminate, interrupt, pseudo states, etc.) corresponding to the UML standard state types. These will be described in details in the next sections. Exit actions are also ideal for clanup when the state becomes inactive. The set_states back-end method allows you to replace a complete state. The functor front-end and eUML offer more capabilities. However, this basic front-end also has special capabilities using the row2 / irow2 transitions._row2, a_row2, row2, g_row2, a_irow2, irow2, g_irow2 let you call an action located in any state of the current fsm or in the front-end itself, thus letting you place useful data anywhere you see fit. The same can be implemented inside entry/exit actions. Admittedly, this is a bit awkward. A more natural mechanism is available using the functor front-end. And that is about all of what is absolutely needed. In the example, the states are declared inside the state machine for readability but this is not a requirements, states can be declared wherever you like. You now have a ready-to-use state machine with entry/exit actions, guards, transition actions, a message queue so that processing an event can generate another event. The state machine also adapted itself to your need and removed almost all features we didn't use in this simple example. Note that this is not per default the fastest possible state machine. See the section "getting more speed" to know how to get the maximum speed. In a nutshell, MSM cannot know about your usage of some features so you will have to explicitly tell it. Note: you might have noticed that the tutorial calls start() on the state machine just after creation. The start method will initiate the state machine, meaning it will activate the initial state, which means in turn that the initial state's entry behavior will be called. The reason why we need this will be explained in the back-end part. After a call to start, the state machine is ready to process events. The same way, calling stop() will cause the last exit actions to be called. We now want to extend our last state machine by making the Playing state a state machine itself (a submachine). Again, an example is also provided. This is about all you need to do. MSM will now automatically recognize Playing as a submachine and all events handled by Playing (NextSong and PreviousSong) will now be automatically forwarded to Playing whenever this state is active. All other state machine features described later are also available. You can even decide to use a state machine sometimes as submachine or sometimes as an independent state machine. Now this state can be used in your submachine. This is neither very readable nor beautiful. And we do not even have any action on the transitions yet to make it even less readable. 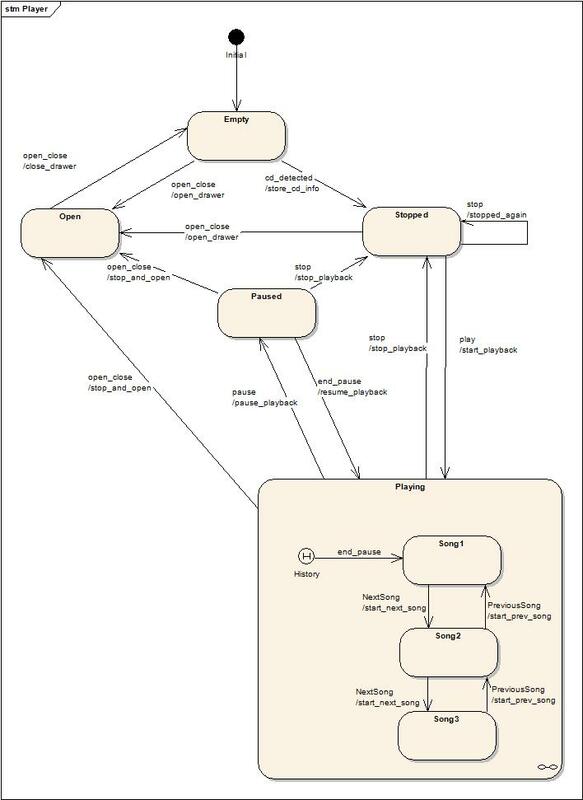 Luckily, UML provides a helpful concept, orthogonal regions. See them as lightweight state machines running at the same time inside a common state machine and having the capability to influence one another. The effect is that you have several active states at any time. We can therefore keep our state machine from the previous example and just define a new region made of two states, AllOk and ErrorMode. AllOk is most of the time active. But the error_found error event makes the second region move to the new active state ErrorMode. This event does not interest the main region so it will simply be ignored. "no_transition" will be called only if no region at all handles the event. Also, as UML mandates, every region gets a chance of handling the event, in the order as declared by the initial_state type. Furthermore, when you detect an error, you usually do not want events to be further processed. To achieve this, we use another UML feature, terminate states. When any region moves to a terminate state, the state machine “terminates” (the state machine and all its states stay alive) and all events are ignored. This is of course not mandatory, one can use orthogonal regions without terminate states. MSM also provides a small extension to UML, interrupt states. If you declare ErrorMode (or a Boost.MPL sequence of events, like boost::mpl::vector<ErrorMode, AnotherEvent>) as interrupt state instead of terminate state, the state machine will not handle any event other than the one which ends the interrupt. So it's like a terminate state, with the difference that you are allowed to resume the state machine when a condition (like handling of the original error) is met. Last but not least, this example also shows here the handling of event deferring. Let's say someone puts a disc and immediately presses play. The event cannot be handled, yet you'd want it to be handled at a later point and not force the user to press play again. The solution is to define it as deferred in the Empty and Open states and get it handled in the first state where the event is not to be deferred. It can then be handled or rejected. In this example, when Stopped becomes active, the event will be handled because only Empty and Open defer the event. Please have a look at the complete example. While this is wanted by UML and is simple, it is not always practical because one could wish to defer only in certain conditions. One could also want to make this be part of a transition action with the added bonus of a guard for more sophisticated behaviors. It would also be conform to the MSM philosophy to get as much as possible in the transition table, where you have the whole state machine structure. This is also possible but not practical with this front-end so we will need to pick a different row from the functor front-end. For a complete description of the Row type, please have a look at the functor front-end. This is an internal transition row(see internal transitions) but you can ignore this for the moment. It just means that we are not leaving the Empty state. What matters is that we use Defer as action. This is roughly equivalent to the previous syntax but has the advantage of giving you all the information in the transition table with the added power of transition behavior. Please have a look at this possible implementation. Notice that the main difference compared to previous diagrams is that the initial state is gone and replaced by a History symbol (the H inside a circle). 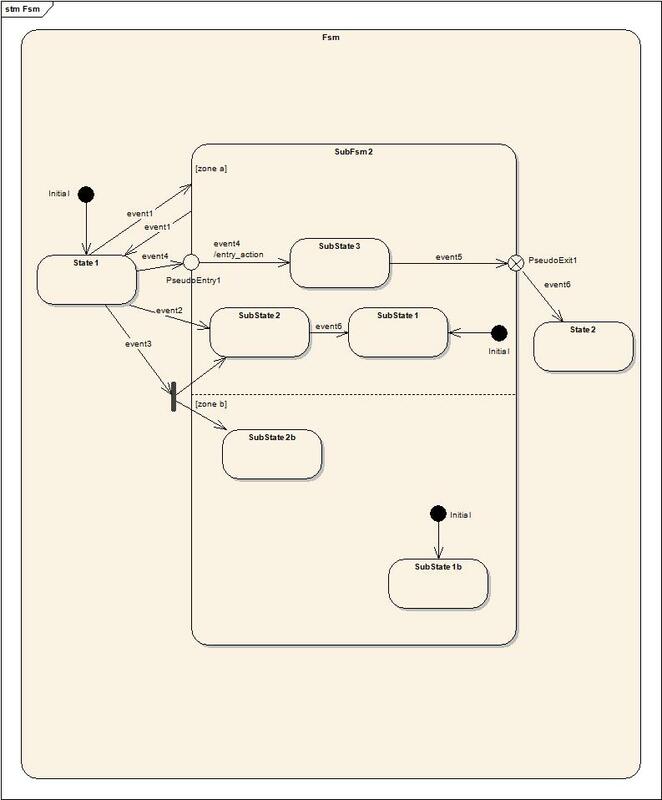 As explained in the small UML tutorial, History is a good concept with a not completely satisfying specification. MSM kept the concept but not the specification and goes another way by making this a policy and you can add your own history types (the reference explains what needs to be done). Furthermore, History is a backend policy. This allows you to reuse the same state machine definition with different history policies in different contexts. 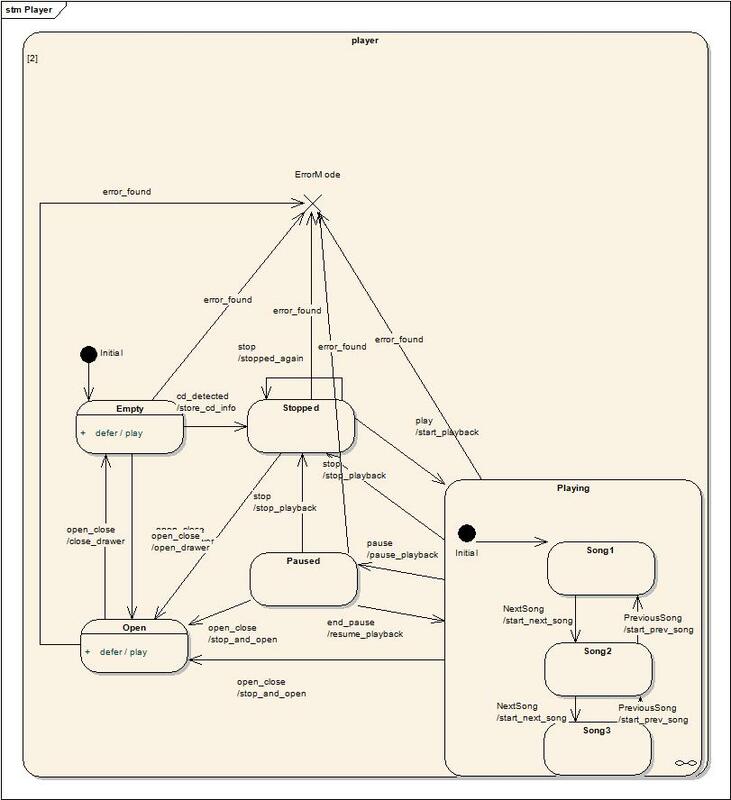 This states that a shallow history must be activated if the Playing state machine gets activated by the end_pause event and only this one (or any other event added to the mpl::vector). If the state machine was in the Stopped state and the event play was generated, the history would not be activated and the normal initial state would become active. By default, history is disabled. For your convenience the library provides in addition to ShallowHistory a non-UML standard AlwaysHistory policy (likely to be your main choice) which always activates history, whatever event triggers the submachine activation. Deep history is not available as a policy (but could be added). The reason is that it would conflict with policies which submachines could define. 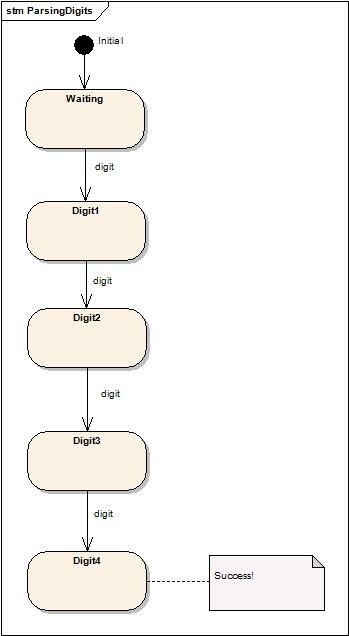 Of course, if for example, Song1 were a state machine itself, it could use the ShallowHistory policy itself thus creating Deep History for itself. An example is also provided. Anonymous transitions are transitions without a named event. This means that the transition automatically fires when the predecessor state is entered (to be exact, after the entry action). Otherwise it is a normal transition with actions and guards. Why would you need something like that? A possible case would be if a part of your state machine implements some algorithm, where states are steps of the algorithm implementation. Then, using several anonymous transitions with different guard conditions, you are actually implementing some if/else statement. Another possible use would be a real-time system called at regular intervals and always doing the same thing, meaning implementing the same algorithm. The advantage is that once you know how long a transition takes to execute on the system, by calculating the longest path (the number of transitions from start to end), you can pretty much know how long your algorithm will take in the worst case, which in turns tells you how much of a time frame you are to request from a scheduler. 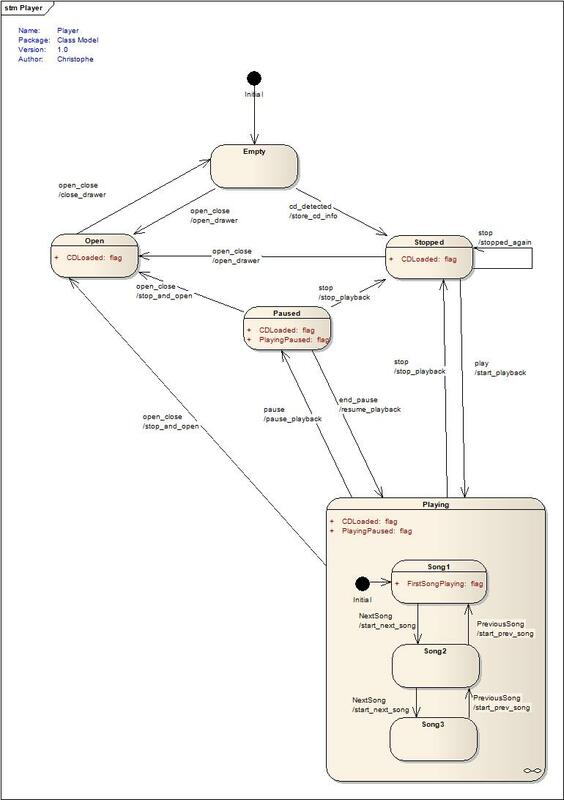 If you are using Executable UML (a good book describing it is "Executable UML, a foundation for Model-Driven Architecture"), you will notice that it is common for a state machine to generate an event to itself only to force leaving a state. Anonymous transitions free you from this constraint. If you do not use this feature in a concrete state machine, MSM will deactivate it and you will not pay for it. If you use it, there is however a small performance penalty as MSM will try to fire a compound event (the other UML name for anonymous transitions) after every taken transition. This will therefore double the event processing cost, which is not as bad as it sounds as MSM’s execution speed is very high anyway. 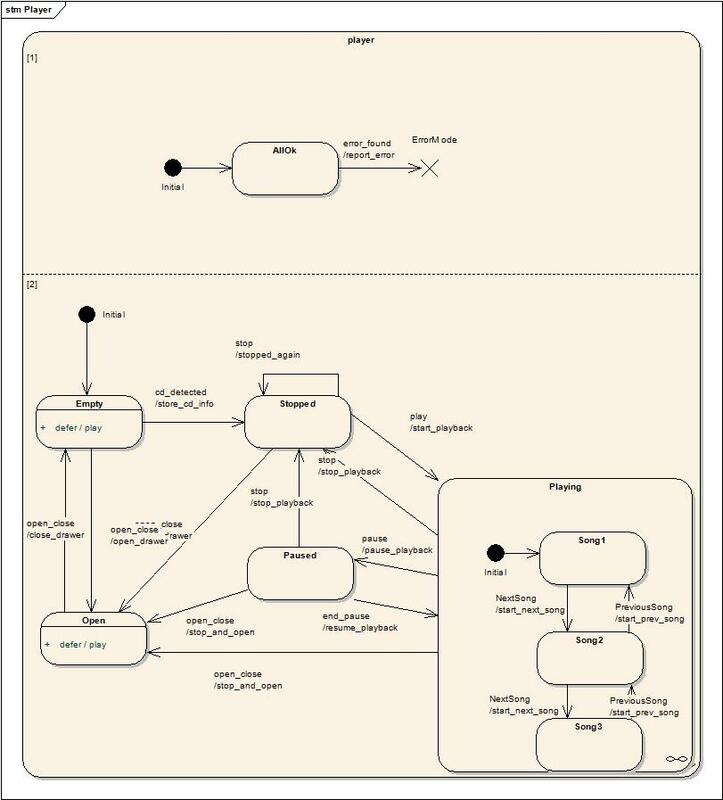 An implementation of the state machine diagram is also provided. Internal transitions are transitions executing in the scope of the active state, a simple state or a submachine. One can see them as a self-transition of this state, without an entry or exit action called. This is useful when all you want is to execute some code for a given event in a given state. These new row types can be placed anywhere in the transition table so that you can still have your state machine structure grouped together. The only difference of behavior with the UML standard is the missing notion of higher priority for internal transitions. Please have a look at the example. they use different but similar row types: a_internal, g_internal, _internal and internal. These types take as first template argument the triggering event and then the action and guard method. Note that the only real difference to classical rows is the extra argument before the function pointer. This is the type on which the function will be called. This also allows you, if you wish, to use actions and guards from another state of the state machine or in the state machine itself. submachines can have an internal transition table and a classical transition table. The following example makes use of an a_internal. It also uses functor-based internal transitions which will be explained in the functor front-end, please ignore them for the moment. Also note that the state-defined internal transitions, having the highest priority (as mandated by the UML standard), are tried before those defined inside the state machine transition table. the first version (using irow) is simpler and likely to compile faster. It also lets you choose the priority of your internal transition. 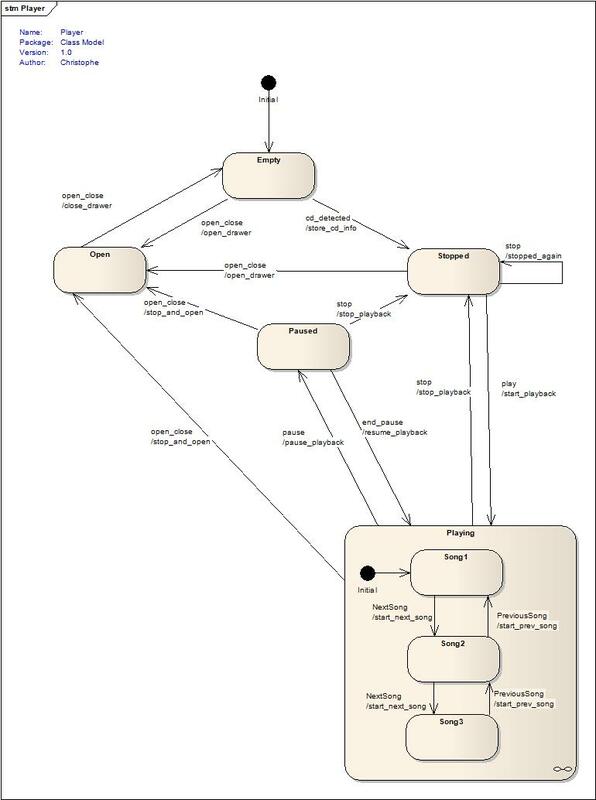 the second version is more logical from a UML perspective and lets you make states more useful and reusable. It also allows you to call actions and guards on any state of the state machine. There is an added bonus offered for submachines, which can have both the standard transition_table and an internal_transition_table (which has a higher priority). This makes it easier if you decide to make a full submachine from a state. It is also slightly faster than the standard alternative, adding orthogonal regions, because event dispatching will, if accepted by the internal table, not continue to the subregions. This gives you a O(1) dispatch instead of O(number of regions). While the example is with eUML, the same is also possible with any front-end. The same capabilities are also available for internal transitions so that we have: a_irow2, g_irow2, _irow2 and row2. For transitions defined as part of the internal_transition_table, you can use the a_internal, g_internal, _internal, internal row types from the previous sections. These row types allow us to distribute the state machine code among states, making them reusable and more useful. Using transition tables inside states also contributes to this possibility. An example of these new rows is also provided. it is only possible to explicitly enter a sub- state of the target but not a sub-sub state. it is not possible to explicitly exit. Exit points must be used. A “normal” activation of SubFsm2, triggered by event1. In each region, the initial state is activated, i.e. SubState1 and SubState1b. An explicit entry into SubFsm2::SubState2 for region “1” with event2 as trigger, meaning that in region “2” the initial state, SubState1b, activated. A fork into regions “1” and “2” to the explicit entries SubState2 and SubState2b, triggered by event3. Both states become active so no region is default activated (if we had a third one, it would be). A connection of two transitions through an entry pseudo state, SubFsm2::PseudoEntry1, triggered by event4 and triggering also the second transition on the same event (both transitions must be triggered by the same event). Region “2” is default-activated and SubState1b becomes active. An exit from SubFsm2 using an exit pseudo-state, PseudoExit1, triggered by event5 and connecting two transitions using the same event. Again, the event is forwarded to the second transition and both regions are exited, as SubFsm2 becomes inactive. Note that if no transition is defined from PseudoExit1, an error (as defined in the UML standard) will be detected and no_transition called. The example is also fully implemented. This sounds complicated but the syntax is simple. First, to define that a state is an explicit entry, you have to make it a state and mark it as explicit, giving as template parameters the region id (the region id starts with 0 and corresponds to the first initial state of the initial_state type sequence). The syntax deserves some explanation. SubFsm2_ is a front end. SubState2 is a nested state, therefore the SubFsm2_::SubState2 syntax. The containing machine (containing State1 and SubFsm2) refers to the backend instance (SubFsm2). SubFsm2::direct states that an explicit entry is desired. MSM can only find out the region index if the explicit entry state is somehow connected to an initial state through a transition, no matter the direction. There is a compile-time cost for this feature. Note (also valid for forks): At the moment, it is not possible to use a submachine as the target of an explicit entry. Please use entry pseudo states for an almost identical effect. Important note 1: UML defines transiting to an entry pseudo state and having either no second transition or one with a guard as an error but defines no error handling. MSM will tolerate this behavior; the entry pseudo state will simply be the newly active state. Important note 2: UML defines transiting to an exit pseudo state and having no second transition as an error, and also defines no error handling. Therefore, it was decided to implement exit pseudo state as terminate states and the containing composite not properly exited will stay terminated as it was technically “exited”. 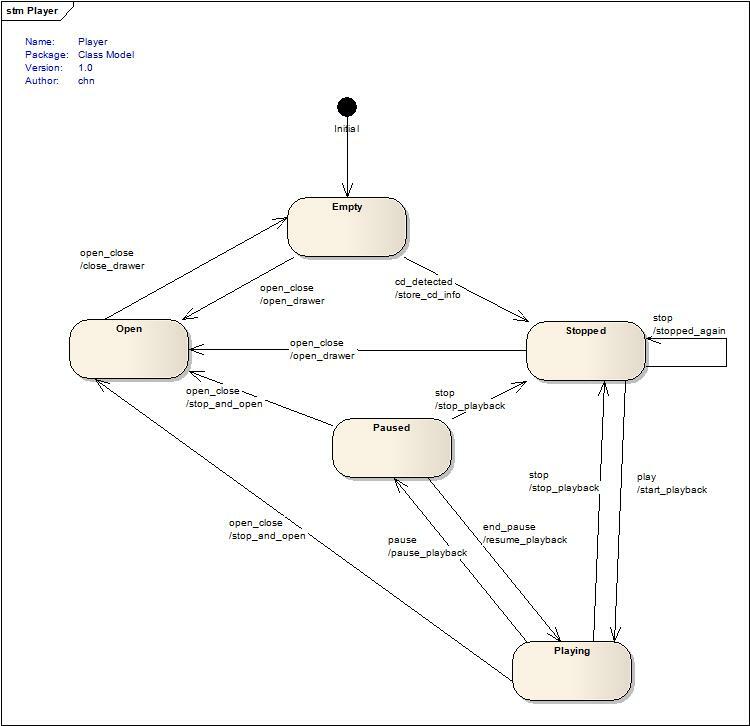 This tutorial is devoted to a concept not defined in UML: flags. It has been added into MSM after proving itself useful on many occasions. Please, do not be frightened as we are not talking about ugly shortcuts made of an improbable collusion of Booleans. While correct and found in many UML books, this can be error-prone and a potential time-bomb when your state machine grows and you add new states or orthogonal regions. And most of all, it hides the real question, which would be “does my state machine's current state define a special property”? In this special case “are my keys in a lock state”? So let's apply the Fundamental Theorem of Software Engineering and move one level of abstraction higher. The following diagram displays the flag situation in the tutorial. And to the same for other digits, we can now fire char_0, char_1 events and this will cause a transition with "digit" as trigger to be taken. An example with performance measurement, taken from the documentation of Boost.Xpressive illustrates this example. You might notice that the performance is actually very good (in this case even better). no_message_queue indicates that no action will itself generate a new event and MSM can save us the message queue. Important note: As exit pseudo states are using the message queue to forward events out of a submachine, the no_message_queue option cannot be used with state machines containing an exit pseudo state. This feature is still supported in MSM for backward compatibility but made obsolete by the fact that every guard/action/entry action/exit action get the state machine passed as argument and might be removed at a later time. to get a pointer to the containing state machine. The same applies to terminate_state / interrupt_state and entry_pseudo_state / exit_pseudo_state.